WASHINGTON (AP) — The government is falling short in ensuring airline pilots keep up their flying skills and get full training on how to monitor sophisticated automated control systems in cockpits, according to the Transportation Department’s internal watchdog. Most airline flying today is done through automated systems that pilots closely monitor. Pilots typically use manual flying skills only briefly during takeoffs and landings. Studies and accident investigations have raised concern that pilots’ manual flying skills are becoming rusty and that pilots have a hard time staying focused on instrument screens for long periods. But the Federal Aviation Administration isn’t making sure that airline training programs adequately address the ability of pilots to monitor the flight path, automated systems and actions of other crew members, the Transportation Department’s Office of Inspector General found. Only five of 19 airline flight simulator training plans reviewed by investigators specifically mentioned pilot monitoring. The FAA also isn’t well positioned to determine how often airline pilots get a chance to manually fly planes and hasn’t ensured that airline training programs adequately focus on manual flying, according to the report, obtained by The Associated Press. It has not been released publicly. In January 2013, the agency issued a safety alert to airlines encouraging them to promote opportunities for pilots to practice manual flying in day-to-day operations and during pilot training. Buy the FAA hasn’t followed up to determine whether airlines are following the recommendation, the report said. The FAA published new rules in 2013 requiring airlines to update their training programs to enhance pilot monitoring and manual flying skills, but the agency is still working on guidance to airlines on how to do that, the report said. Airlines aren’t required to comply with the rules until 2019, the report said. “Because FAA hasn’t determined how carriers should implement the new requirements or evaluated whether pilots manual flying time has increased, the agency is missing important opportunities to ensure that pilots maintain skills needed to safely fly and recover in the event of a failure with flight deck automation or an unexpected event,” the report said. 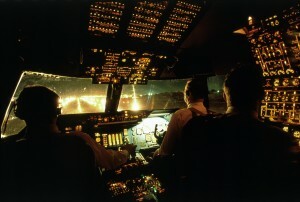 The rules on enhancing training were prompted in part by the 2009 crash of a regional airliner while approaching Buffalo, New York. The crash killed all 49 people on board and a man on the ground. An investigation by the National Transportation Safety Board revealed that the pilots weren’t closely monitoring the plane’s airspeed, which began to decrease to dangerously slow levels. Thus the captain was startled when a safety system called a “stick shaker” automatically went on, violently rattling the control yoke. Instead of pointing the plane downward to pick up speed, the captain pulled back on the yoke to increase altitude. That slowed the plane even more, leading to an aerodynamic stall. The plane fell from the sky and landed on a house. The board concluded that the monitoring errors by the flight crew demonstrated the need for more specific training on active monitoring skills. The U.S. and other countries are transitioning to satellite-based air traffic systems and reducing their reliance on radar. Among the advantages of satellite-based navigation is that pilots can fly planes closer together. That allows more takeoffs and landings, and reduces congestion to meet growing demands for air travel. But the precision of automation is necessary in order for planes to safely fly closer together. As automation increases, pilots have fewer opportunities to use manual flying skills. Industry studies and committees have found that pilots who don’t get to use their manual flying skills may not be prepared to handle unexpected events. Two of the nine airlines visited by investigators actively discouraged pilots from manual flying under normal conditions. He said the FAA agrees with a recommendation about developing standards to determine whether pilots have enough opportunities to practice manual flying skills. The FAA hopes to provide guidance to airlines on pilot monitoring by Jan. 31, 2017, he said. Left: Photo by Getty Images.